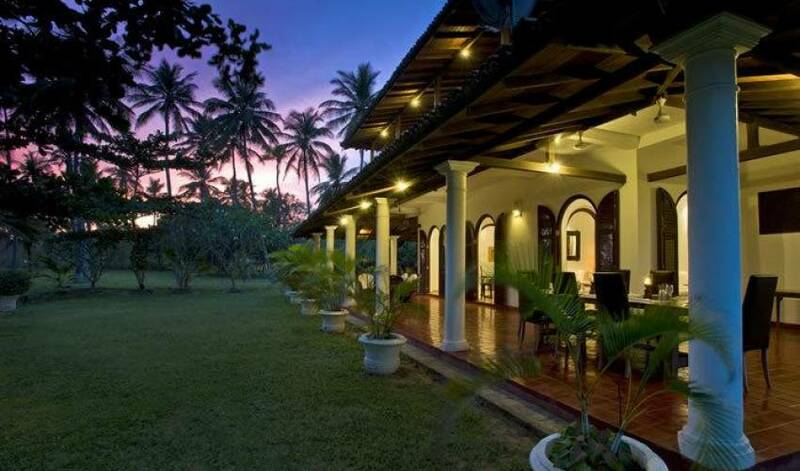 Sensationally situated on Sri Lanka’s southern coast, Villa 1374 offers a true taste of exotic seclusion. With four spacious bedrooms boasting spectacular views, this colonially-inspired villa also features comfortably furnished wraparound verandas; a fully-equipped kitchen and an air conditioned TV Room. 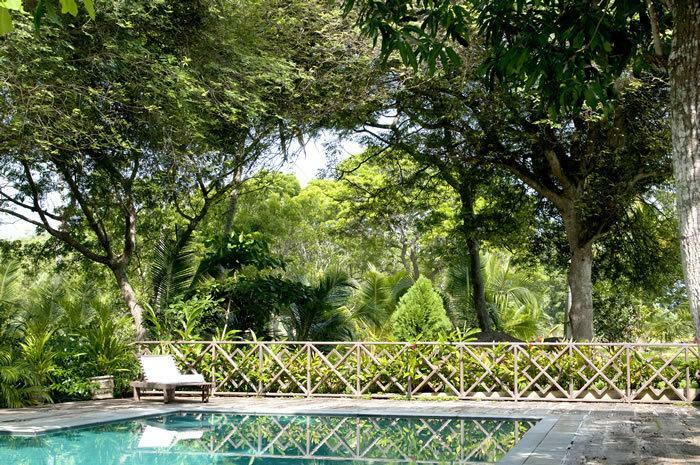 In the extensive, tropical, bird-filled garden beyond sits a gorgeous swimming pool that’s the perfect place to cool off in the heat of the day, whilst opportunities for exploratory walks along the near-deserted beach are endless. 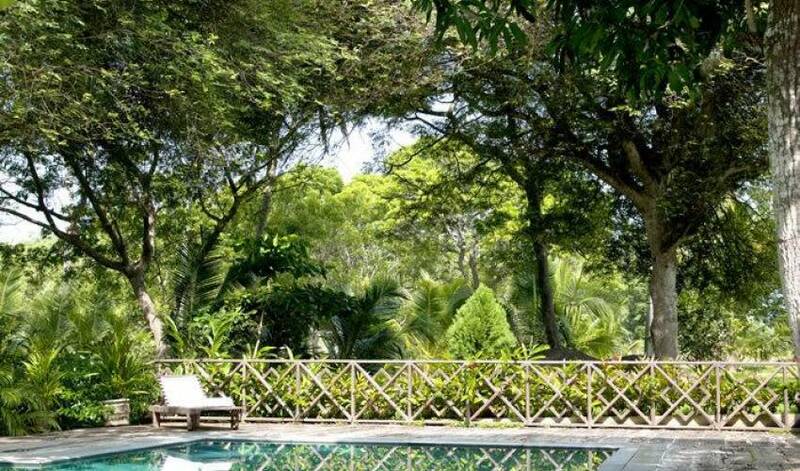 Fully-staffed, Villa 1374 is beautifully private and perfectly suited for families, groups and nature lovers looking to completely relax and unwind. 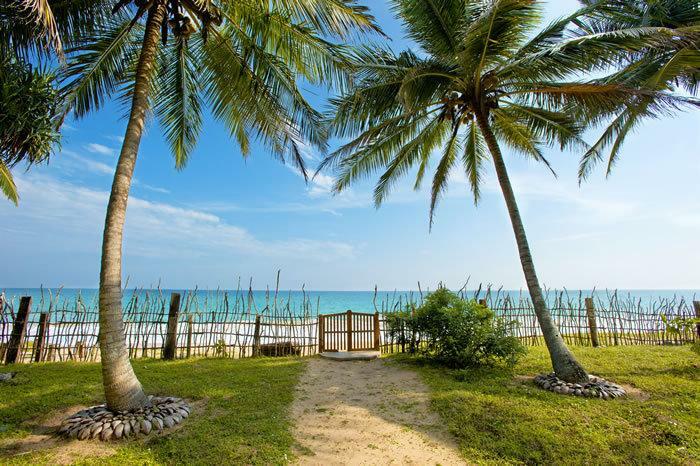 Private, peaceful and picturesque, Villa 1374 is a spectacular property which, as its name suggests, lies within a whisper of the soulful sea on Sri Lanka’s dramatic southern coastline. 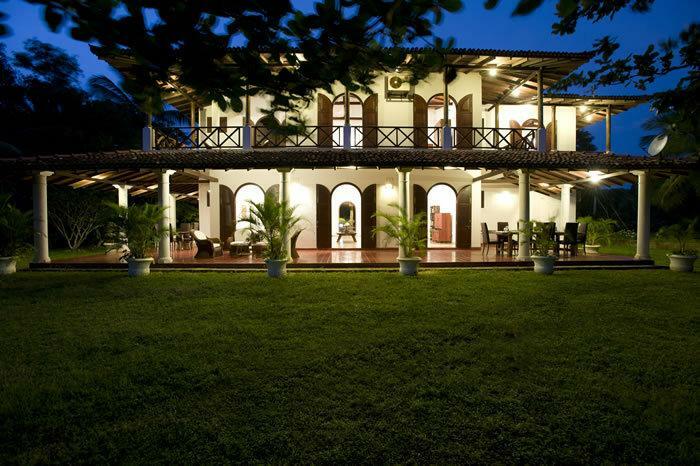 Although Villa 1374 is only six years old, its elegant architecture and antique furnishings tell a different tale. 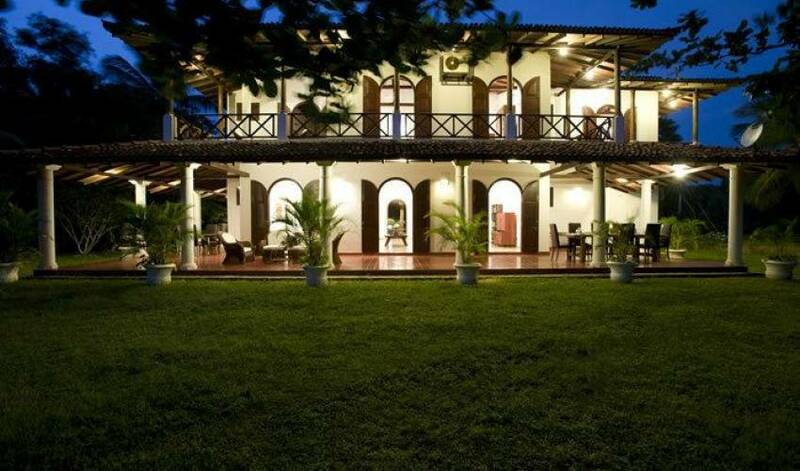 Soaring ceilings, gentle archways and deep verandas that wrap around the house on two levels mimic the beautiful designs of the Dutch colonialists and allow gentle breezes to infiltrate and cool the interiors. The house offers a plethora of living and dining areas that are beautifully positioned for admiring the views. With its four beautifully spacious ensuite bedrooms: two doubles, a twin and a single ground floor room with a baby cot, Villa 1374 is particularly suitable for families with younger children. 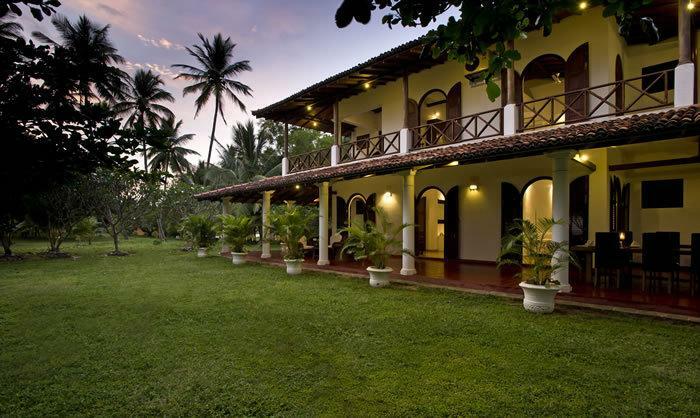 The house is looked after by a welcoming staff team who tend to your every need with traditional Sri Lankan hospitality, whilst trips to nearby Tangalle, national parks, bird-filled wetlands and cultural sights can all be arranged with ease. Villa 1374 is a two-storey property with a pair of staircases that lead up from the hallway and the kitchen to spacious ensuite bedrooms and a wraparound balcony furnished with cushioned seating for admiring the views. The ground floor living space comprises an air conditioned TV Room and furnished hallway that connects a pair of deep verandas at the front and back of the property, looking either towards the sea or over the swimming pool. Each of Villa 1374 ’s four air-conditioned bedrooms come with plenty of space, polished cement floors, high vaulted ceilings, beautifully comfortable beds and – through elegantly arched sets of timber doors – far-reaching views of the garden, the swimming pool and the ocean beyond. Three bedrooms are located upstairs and a fourth on the ground floor. Although linked by a deep wraparound balcony, the three upstairs bedrooms are positioned in such a way that they enjoy plenty of privacy, even from each other. The master bedroom is at the front of the house on the first floor. It is a hugely generous space featuring a king-sized four-poster bed draped in soft mosquito netting, a squashy sofa and an ensuite bathroom with shower. 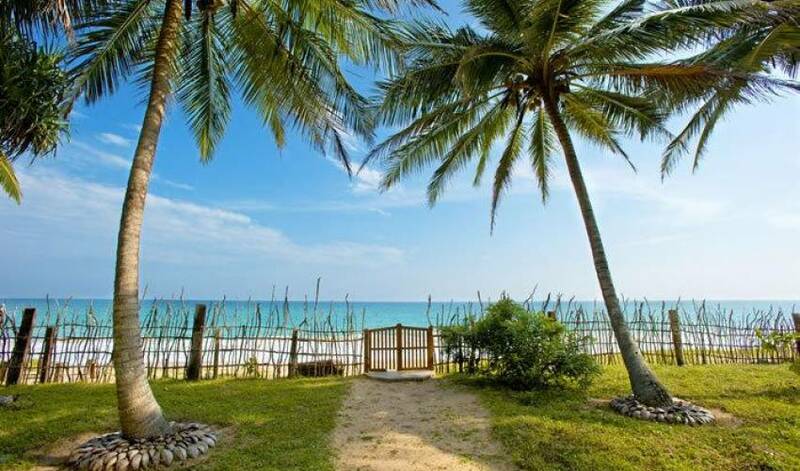 Oriental wardrobes stand at either side of the room whilst a number of arched doorways spill onto the veranda in front where, in a private corner, rattan loungers are positioned to gaze at the sea. The entrance to the master bedroom is via a small air conditioned room furnished with a daybed which could be used either for reading or for sleeping a child. This room has an ensuite bathroom (with tub) and access onto the master bedroom’s balcony lounge. Accessed either from the stairs leading up from the hallway or through an interconnecting door to the master bedroom is a spacious twin room that generously features twin four-poster queen-size beds, a duo of oriental wardrobes and arched doorways that spill onto the rear veranda overlooking the swimming pool and garden beyond. An ensuite bathroom comes with twin hot water showers. The third bedroom on the upper floor comes with an antique four-poster king-size bed and views, through arched doors, out to the garden and sea. This room has an ensuite bathroom with hot water shower. The ground floor bedroom is furnished with an antique four-poster single bed draped in soft mosquito netting, as well as a sofa and a baby cot (which can be moved to any other room in the house as required). An ensuite bathroom comes with cupboard storage and a hot water shower. Villa 1374 is blessed with many beautiful spots for living and dining, serenely soaking up the spectacular natural views in absolute privacy. To the front and rear of the property are two deep verandas linked by a spacious hallway running through the house that’s elegantly furnished with a pair of built-in sofas to either side topped with soft mattresses and cushions. To the rear and overlooking the swimming pool is an informal living veranda with reclining planters’ chairs and a table with two benches for relaxed daytime dining. Polished tiles are easy on your feet whilst whirring ceiling fans above keep you cool; speakers are built into the rafters. On the veranda to the front of the house is a more formal living space with a dining table seating up to ten on one side and a cosy clutch of rattan chairs to the other. The sea’s crashing waves can be seen beyond the grassy lawn of the garden. The elongated, air-conditioned TV lounge features a 42-inch satellite-enabled TV and DVD player plus a squashy white sofa. A trio of arched doorways beyond a small circular table lead onto the front veranda whilst an ensuite bathroom with shower is conveniently accessed to the rear. In the kitchen, abundant dark wood units are topped with polished black granite worktops. This fully-equipped area comes with an oven, hot plates, fridge storage and a microwave. 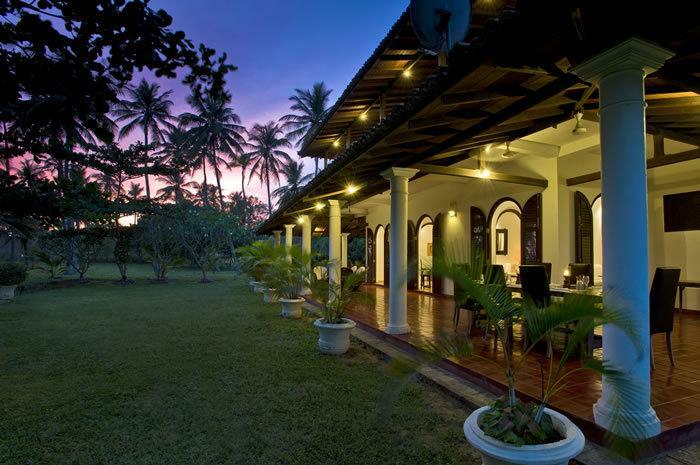 During your stay at Villa 1374, savour the delights of Sri Lankan and western cuisine freshly cooked by our villa staff. On the menu for breakfast is always a profusion of fresh tropical fruit whilst the villa’s spectacular coastal setting means that seafood and fish are available in abundance and highly recommended. Light bites for lunch include soups, salads and sandwiches whilst for dinner we’ll indulge you with a sensational Sri Lankan rice and curry spread. On your arrival at the villa, a short discussion with our cook will give you an idea of the range of dishes on offer, and we recommend you liaise with him after breakfast every day regarding your meal arrangements to allow the staff time to provision and prepare. Please also let the staff know of your likes and dislikes and any special dietary requirements or allergies. You are welcome to self-cater if you would prefer; our staff will assist you in the kitchen or leave you to your own devices, whichever suits you best. Breakfast is included in the villa rate whilst for all other meals the villa operates a kitty system. We ask that you provide a float for the staff who will then purchase all of the provisions – including soft drinks, beer and local spirits – at cost price with a small charge for transport. Receipts will be provided either daily or at the end of your stay according to your wishes. A small selection of wine and international liquor can be bought locally, however if you have any favourites we recommend that you purchase them from the airport duty free where there is much more choice. A driver and car can be arranged with advance notice for airport transfers, local tours to national parks and onward travel. Our personable staff team are dedicated to providing you with the best care possible throughout your stay so that you feel immediately at home. 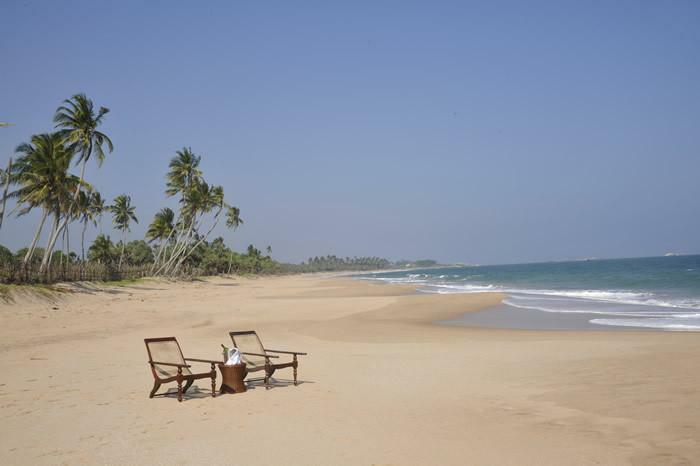 Recruited from the local area of Tangalle they tend to you in the traditional Sri Lankan way and take the time to satisfy your needs and expectations 24 hours of the day. One villa manager :The villa manager (who lives offsite) is in charge of overall villa operations and staffing, and is on call to fulfill your individual expectations and preferences. One maid: We have one part-time maid who assists with housekeeping and also provides guests with a complimentary laundry service. One cook :Our cook is in charge of satisfying your taste buds with his range of Sri Lankan and western cuisine. Two houseboys :Our friendly houseboys keep the house shipshape, wait on your table at mealtimes and are also responsible for maintaining the swimming pool. Ten gardeners :Our 23-acre garden takes some looking after and so we have ten discreet gardeners to keep it in shape. 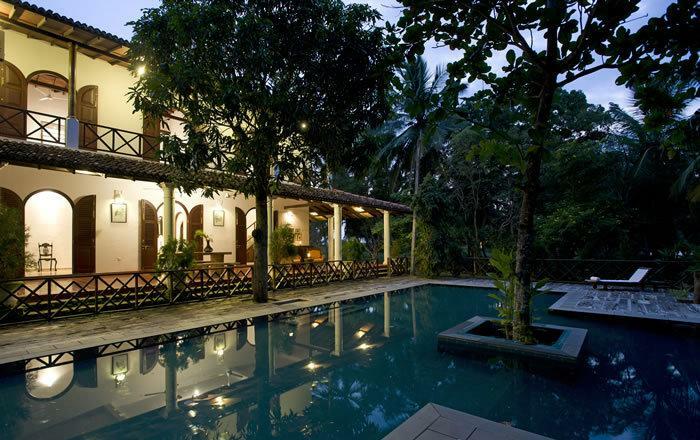 Villa 1374’s sensational seclusion, its dramatic coastal setting and generous outdoor space not to mention its privacy make it a wonderful place for hosting events of up to 25 people. 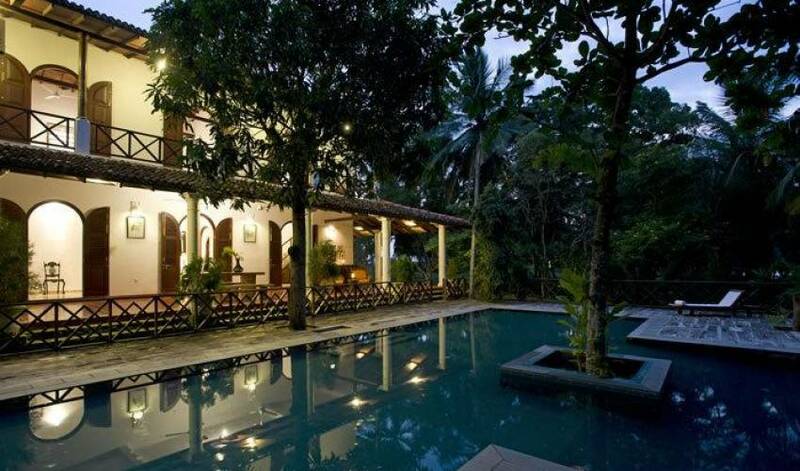 Villa 1374 sits in seclusion on the fringe of the village of Kahandamodera, 16km east of Tangalle. Kahandamodera is scattered with simple homes encircled by kitchen gardens whose inhabitants make their living from fishing and farming. Access to the property is well off the main road through the narrow lanes of this rural region, passing paddy fields and small lotus-strewn lakes that see visitations from many birds. 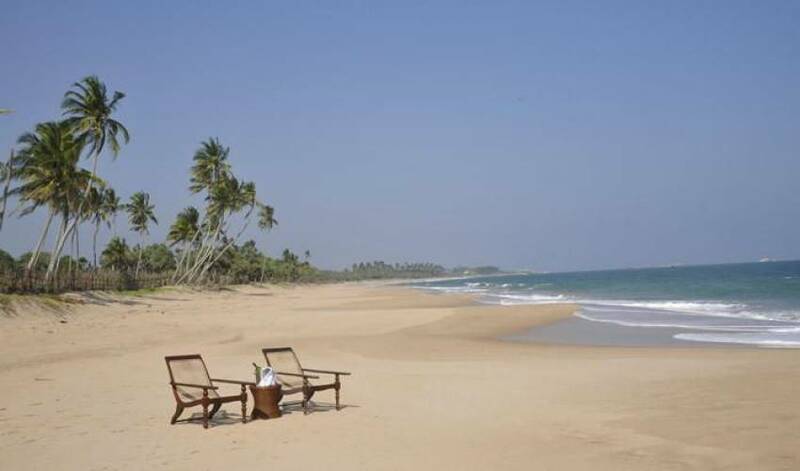 The beach to the front of Villa 1374 is often visited by marine turtles and extends to the east across a rocky outcrop towards Kalametiya wetlands and the barren red earth of Ussangoda. To the west it continues towards Tangalle where a small selection of restaurants, banks, pharmacies and supermarkets can all be found.